It’s almost carnaval time again here in Tenerife and it is celebrated in every town and village on the island, Santa cruz being the most spectacular carnaval, closely followed by Puerto de la Cruz. Festivities are due to kick off in Santa Cruz on the 18th Feb and will attract thousands of visitors to the area. All events take place in the decorated streets, with the main events held in Plaza de España. You will find stalls, music kiosks and street parties everywhere which give a truely festive atmosphere. During carnaval there are daily competitions between various carnival groups, bands and dance schools as well as fancy dress competitions and a parade of antique cars. 18th February: Gala for the Election of the 2009 Carnival Queen. A huge gala evening, lasting several hours to elect both the Carnaval Queen and the Junior Carnaval Queen. If you can’t make it to this event then don’t miss it on TV. The costumes get bigger and more spectacular each year. Cabalgata Anunciadora (Announcing Parade), The newly elected Carnaval Queen leads the parade through the streets. The procession is followed by a firework display. 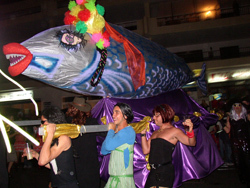 The Coso Apoteosis, a huge spectacular parade through Avenida de Anaga and Marítima, starting around 4 p.m. Ends in a spectacular firework display around 9 p.m.
25th February: Burial of the Sardine. This is a very amusing event for first timers to Carnaval. Men dress up as “Widows” to mourn the death of the sardine! Gran Concurso en la Ciudad de Automóviles Antiguos – a parade of beautiful vintage cars starting from the Calle La Noria in the old part of Santa Cruz. Fancy dress is optional, but if you really want to take part then a costume is a must, any costume goes, but if you want to match this year’s theme it’s “el cine de terror” Horror Films. This year’s poster was chosen from 111 entries, and the winning poster was by Gonzalo Luis Álvarez Fernández and entitled “Bailarina Monstruosa” (Monstrous Dancer). Don’t even think of taking a car, it’s a nightmare, you will never get parked. The 111 bus runs to Santa Cruz from Las Americas and Los Cristianos and many extra busses run during the night to ferry people home. If you are staying in the Los Gigantes area there are several local companies like El Mar Services who will be making arrangements. Many of the hotels will also be laying on transport.